Love is in the air at Zemra on Valentine's Day! 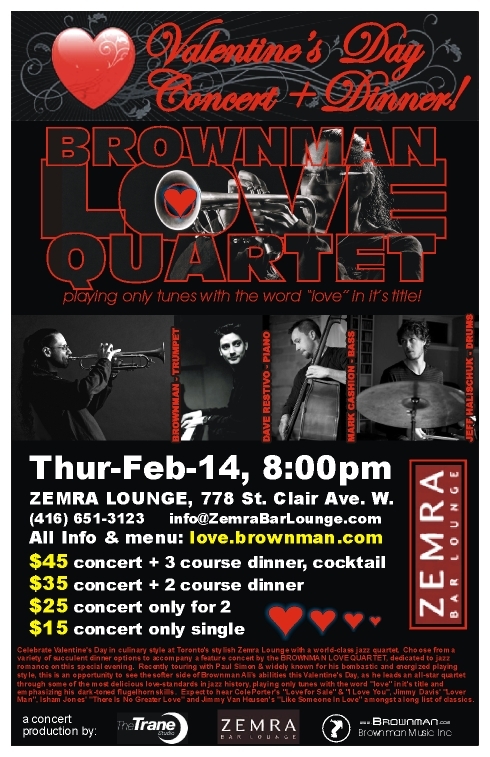 Celebrate Valentine's Day in culinary style at Toronto's stylish Zemra Lounge with a world-class jazz quartet. Choose from a variety of succulent dinner options to accompany a feature concert by the BROWNMAN LOVE QUARTET, dedicated to jazz romance on this special evening. Widely known for his bombastic and energized playing style, this is an opportunity to see the softer side of Brownman's abilities this Valentine's Day, as he leads an all-star quartet through some of the most delicious love-standards in jazz history, playing only tunes with the word "love" in it's title and emphasizing his dark-toned flugelhorn skills. Back in Toronto after touring with Paul Simon, for this special Valentine's Day concert, award-winning jazz trumpet player Brownman Ali and this aptly named "Love Quartet" will play selections from the great American songbook that feature the word "love" in it's title. Expect to hear Cole Porter's "Love for Sale" & "I Love You", Jimmy Davis' "Lover Man", Isham Jones' "There Is No Greater Love" and Jimmy Van Heusen's "Like Someone In Love" amongst a long list of classics. 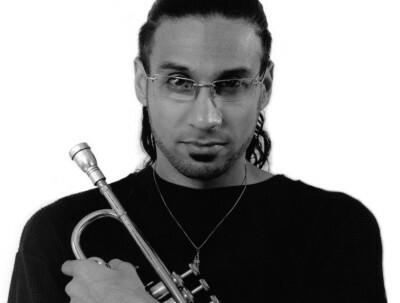 ABOUT BROWNMAN -- Heralded as “Canada’s preeminent Jazz trumpeter” by NYC’s Village Voice, Brownman Ali - born on the small Caribbean island of Trinidad, & schooled in NYC - is a multiple award-winning NYC-schooled protégé to his teacher, Grammy-winning trumpet legend, Randy Brecker. Tirelessly leading 7 unique ensembles of his own (including the internationally acclaimed BROWNMAN ELECTRYC TRIO, and the award-winning CRUZAO latin-jazz quintet), when not in high demand in the studio world he is considered to be one of the most unique and provocative improvising trumpet players on the scene today and is widely regarded as a vanguard for the evolution of Jazz in Canada. A highly decorated player, his accolades include several National Jazz Awards, a CBC Galaxie Rising Star award, a SOCAN composers award, a Toronto Independent Music Award, an induction into the WHO'S WHO IN BLACK CANADA, a BRAVO! channel documentary on his life, NOW magazine naming him "Jazz Artist of the Year", CBC Radio Canada citing him as "one of the most recorded trumpet players in Canadian history" and is listed by Air Canada as one of the "top 10 reasons to visit Toronto". ABOUT DAVE RESTIVO -- Five-time National Jazz Award winner for "piano player of the year", Dave is one of Canada's most respected and influential jazz artists, well-known for his work with Rob McConnell's The Boss Brass and Tentet, the Mike Murley Quintet, and legendary songwriter Marc Jordan. He has also performed and recorded with Dave Holland, Kenny Wheeler, John Abercrombie, Jerry Bergonzi, Mel Torme, Pat LaBarbera, Ingrid Jensen, Carla Bley, Steve Swallow, George Garzone, Howard Johnson, Christine Jensen, Kevin Mahogany, Randy Bachman, David Clayton-Thomas, Molly Johnson, Moe Koffman, Joe LaBarbera, and many many others. ABOUT MARK CASHION -- One of the most in demand upright bassists in Toronto right now, his impecable time sensibilities have made him the backbone of several acclaimed groups in the city including STRANGE ATTRACTORS, TIM HAMEL QUARTET & BROWNMAN AKOUSTIC TRIO as well as being first call to several female songstresses such as MELLISA LAUREN, BEVERLY TAFT & HOLLY CLARK. He has also appeared with the SHUFFLE DEMONS. ABOUT JEFF HALISCHUK -- In the new breed of 20-something drummers emerging in Toronto's bustling jazz community, Jeff is a name that often comes up. Highly in demand for his extradinarily sensitive playing and his interactive musical dialog, Jeff is one of the first calls made for the drum chair for the DEL DAKO QUINTET, BRADLEY & THE BOUNCERS, LAURA MARKS, DARYL ORR QUARTET, BROWNMAN AKOUSTIC TRIO and far too many more to name here.